I am so in the mood for spring to hurry up and JUST GET HERE ALREADY. I need to get my hands dirty. OK, I could just dust the coffee table and gets my hands dirty, but it’s so much more fun to do it outside feeling the sunshine on my back and hearing the birds twitter about in the trees. 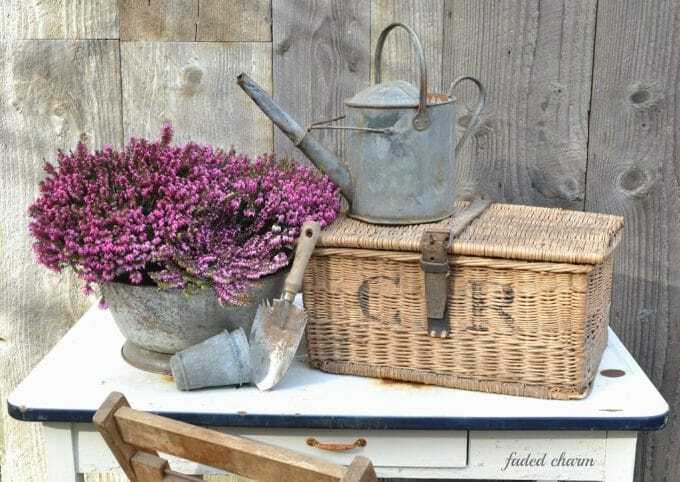 Kathleen at Faded Charm has a wonderful display designed around her heather plant. Look!!! She has real zinc flower pots, not like my fake-ola ones! 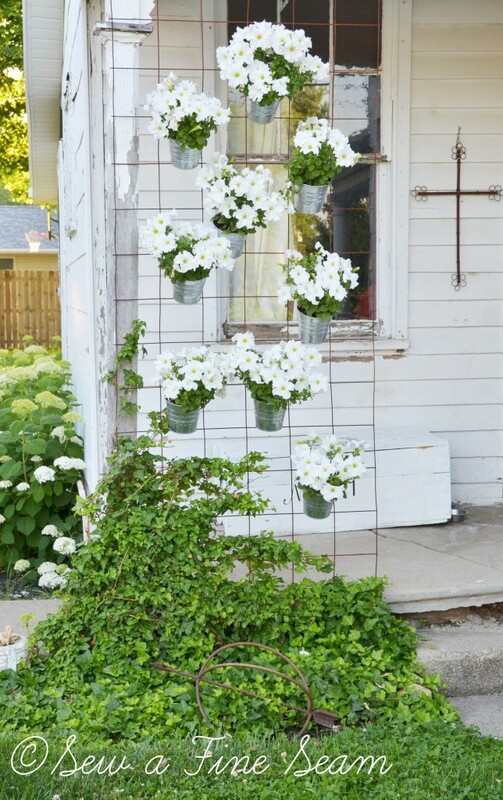 Jill at Sew A Fine Seam has a fence full of gorgeous petunias in Ikea galvanized pails. I met Jill at the Country Living Fair this fall and she’s just as cute as can be. You have to check out her sewing business. I see her stuff at the local shops and she sells at the Springfield Extravaganzas too! 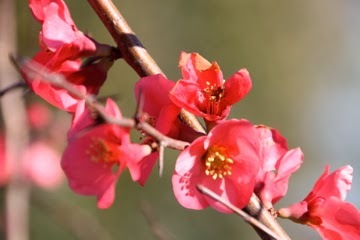 Bonnie at Living With Thanksgiving has some beautiful photos of spring flowers in her neck of the woods, including this flowering quince. Debbie at Confessions Of A Plate Addict (and oh, she IS a plate addict!) 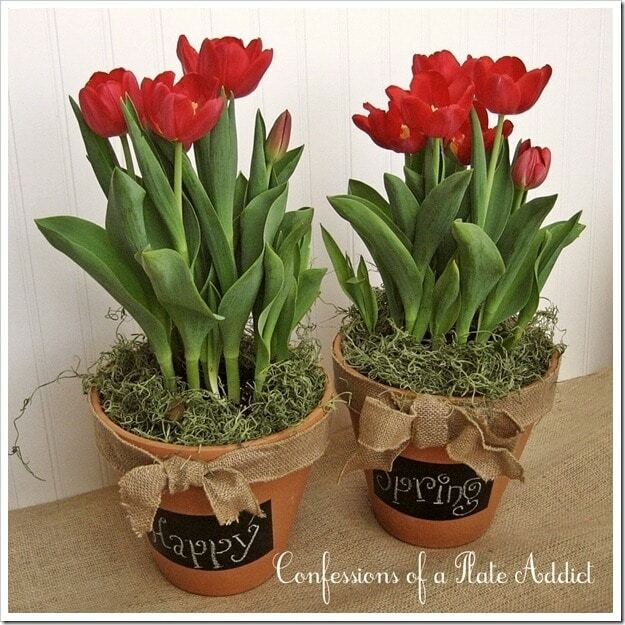 has a tutorial on how to make these chalkboard flower pots for spring. Pamela at Flower Patch Farmhouse shows how to make a garden obelisk. 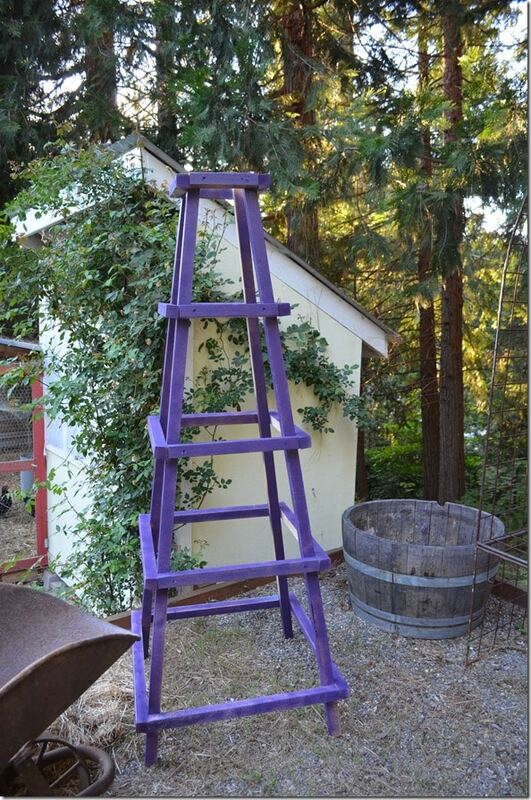 And what’s more fun for the garden than a purple one! 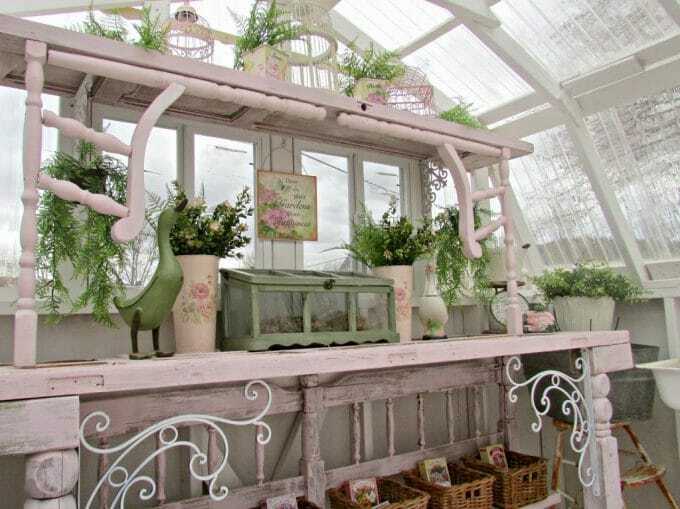 Pamela also shared her potting bench that she decorates for the different seasons. 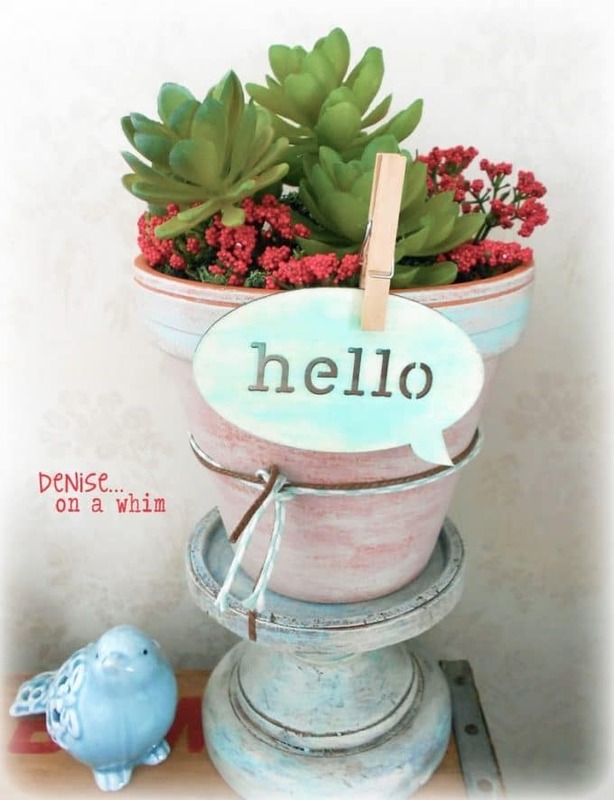 Denise at Denise On A Whim is bringing spring into her home with some fresh and fun succulents. 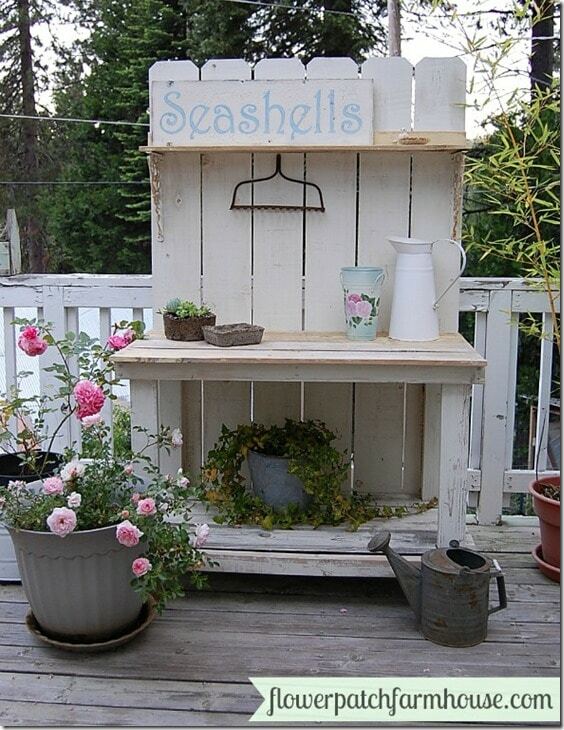 Penny at Penny’s Vintage Home has created a potting bench out of old doors and a headboard from a bed. Diane at Design Till It Shines gives us a tour of a lake in SW Washington. In other Pam news, I went to an estate sale on Friday!!! Yes, estate sale season is heating up in the hood. I’ll show you some photos as soon as I get my loot cleaned up. Why is estate sale stuff so dirty? 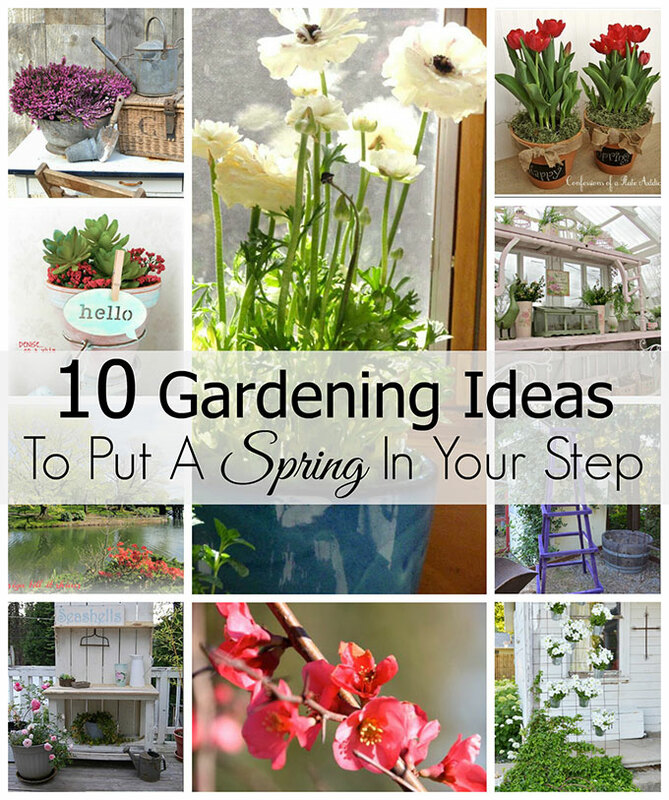 Love the spring inspiration that you’ve highlighted in this post. We had sun and 40 degrees yesterday. I even saw evidence of melting. Our mountains of snow look slightly smaller!! Can’t wait to see what you found at the estate sale! Oh, spring, where are you? Your inspiration photos have me itching to get out in the yard…..after our 4 feet of snow melt, that is. An estate sale already? Luck you! I can’t wait to see your cleaned up goodies! I want to figure out how to make one of those myself. Maybe a picnic basket from Goodwill and some paint and voila it’s a french basket. The pictures are so pretty, can’t wait, can totally agree with your preference to get your hands dirty outside, rather than getting them dirty inside, dusting and such. We are all hoping to get above freezing this weekend. We are all so giddy about that, you would think we won the lottery! Maybe this weather is headed your way? Yesterday was 57 and today was low 50’s. Not exactly Florida or anything, but I’ll take it! 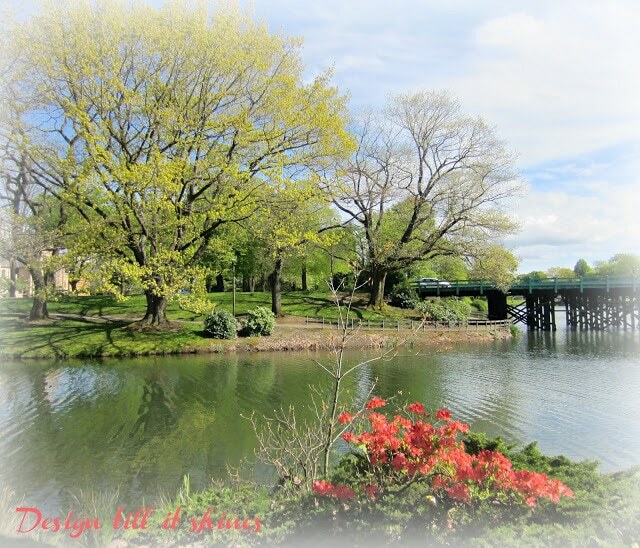 Pam…pinned and featured you link in my round up post. Some great inspiration! 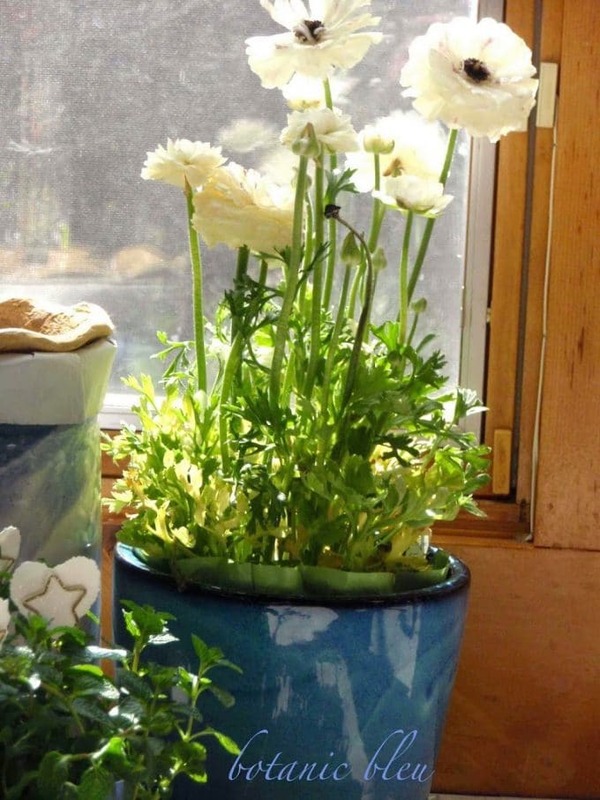 Thank you for including Botanic Bleu’s Early Spring Plants in your round-up. There are so many spring-inspiring posts in the Mega Spring Linky Party that I am still visiting them. Wonderful ideas! Thanks for sharing! Very inspiring!